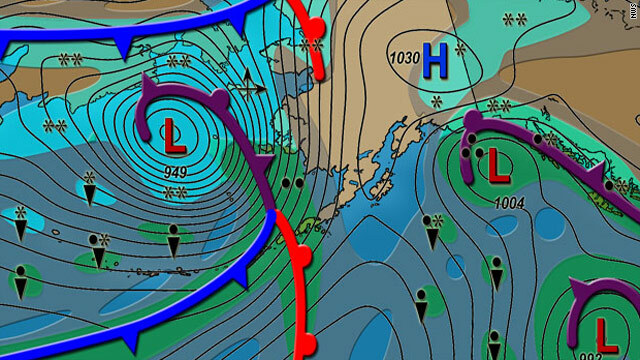 The National Weather Service forecast map for Alaska on Tuesday. Alaska is facing a life threatening winter storm with near hurricane force winds, more than a foot of snow and severe coastal flooding, the National Weather Service says. "This is an extremely dangerous and life-threatening storm which will be one of the worst on record over the Bering Sea and the west coast," NWS forecasters said in a bulletin Monday afternoon. The storm was about 600 miles southwest of Shemya in the far western Aleutian Islands on Monday afternoon and was expected to move over the Bering Sea toward Alaska's west coast on Tuesday. Winds near hurricane force of 74 mph were expected to generate seas as high as 25 feet in the northern Bering Sea, forecasters said. The winds were expected to raise sea levels as much as 9 feet in the Norton Sound. Those levels combined with the high waves were expected to cause significant coastal erosion and major flooding. The winds may also push sea ice on shore, adding to the dangers, NWS forecasters said. Alaska's west coast could also see as much as 14 inches of snow in blizzard conditions, forecasters said. The storm was expected to last into Wednesday. I HOPE EVERYONE STAYS SAFE!!!!! hi!,I love your writing so a lot! proportion we keep in touch more about your article on AOL? I need an expert in this area to resolve my problem. May be that is you! Having a look forward to see you.